After you program the treadmill at your gym, you start slowly walking with the timing of the belt. However, as you glance over at the elliptical machines and see how hard that the users are working on them, you wonder if you made the right choice in which equipment to use. Thankfully, you aren't the only one to have this concern, and chances are, your fears remain founded. While treadmills have their place in your exercising mix, you might want to switch things up now and again by hopping on the elliptical next time. Although the two machines remain similar, their differences make it evident that there is one that works your muscles more efficiently time and again. You can't beat the conditioning of a treadmill for when you need to build up towards a marathon or foot race, but ellipticals tend to win out each time. Continue reading to discover some of the benefits of ellipticals that outweigh their flat surfaced counterparts. You may find yourself convinced next time you need some cardio. The one area that more health enthusiasts can agree on that treadmills remain superior at is the difficulty to learn how to use them the first time. For decades, treadmills have been the default training tool for anyone getting serious about getting into shape. One reason why the treadmill stays simple to learn is that the first model was initially a form of prison punishment. During the same era that criminals would need to break down rocks all day, a treadmill was both a torture device as well as a water wheel or grain mill. Since the early 1800s, improvements have gotten made to create a safe training environment for consumers. Even those who have never exercised before instinctually take to the simple moving platform. Using the elliptical for the first time can quickly get challenging, as well as making for some embarrassing Instagram posts. However, if you continue trying it, you'll learn how to use it as well as you do a treadmill. It wasn't too long ago that doctors recommend going for a daily run to stay in shape. Today, however, we now know that running is an activity that puts a ton of wear and strain on many of your body's muscles and joints. Each hit of your foot against the pavement sends the impact rippling through your lower half, where it harms your knees, ankles, shins, and other vulnerable areas and joints. Even with expensive running shoes and inserts, running soon takes its toll daily. Using a treadmill does help lessen the blow on every step, and it is the recommended way to train for running events. However, it does still similarly impact your joints, albeit on a slightly more padded surface. By relying on the hovering foot paddles of ellipticals, there is far less impact damage and a smoother, safer session. If you climb off a treadmill and immediately start seeking out a chiropractor, try giving the elliptical a try next time. Running tends to improve your lung capacity, stamina, and your leg muscles. While these are all beneficial to those trying to enhance their running capabilities, it leaves a lot of muscle groups untouched during your cardio workouts. Like treadmills, most best ellipticals come standard with several different programs or apps that dedicate your session to specific regions of your body. However, in the process, it's working way more sections than half an hour on the treadmill would accomplish. Many of these preprogrammed exercises include movements such as pedaling backward or using the moving hand grips. These create a ski-like pattern that exercises your arms, shoulders, and chest while moving your feet backward exercises different leg muscles. When using the treadmill leaves you feeling dissatisfied with your exercise results, then you likely aren't taking your cardio session far enough. Try using a program on the elliptical next time to feel like you did some work. You finally complete your treadmill session, and your shirt is dripping with sweat. However, you glance down on the console, and you can't believe how few calories the machines said that you burned. The reason why is likely that, not only are you exercising the same lower body muscles each time you step onto the treadmill, but your body is adapting to their repeated sessions. When you work out the same muscle group each time, it creates diminishing returns which doesn't provide as successful of results as it used to achieve. Ellipticals, on the other hand, provide many opportunities to burn through more calories than what you could see on a treadmill. From the oval-like pattern that your steps take, to creating a head-to-toe exercise plan, ellipticals remain more efficient at burning calories. When you need to burn off what you consumed over the weekend, and you don't have all day to work out, a quick half an hour session might be all that you need. 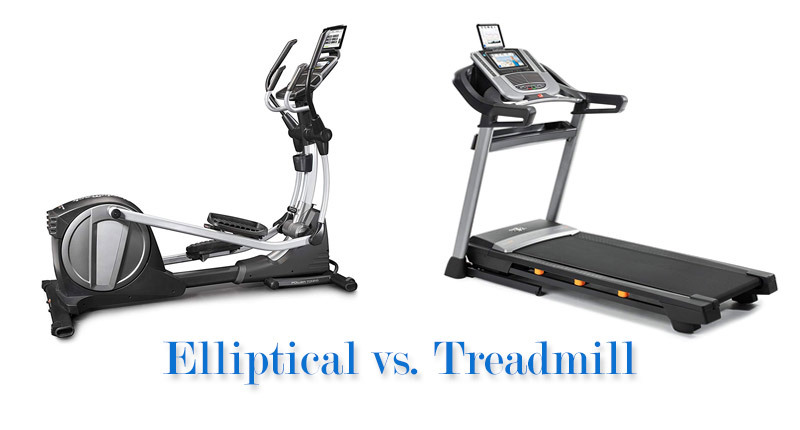 To burn more calories, take a break from the treadmill and use the ellipticals instead. It can get hard to stay motivated on a treadmill, as all that you're doing is walking in place while facing a wall. After some time, it begins to feel like you're in detention. While many treadmill models have different exercise programs for users to enjoy, they often aren't as beneficial as you would hope that they would become. How can you make walking in place more exciting or more challenging when you only control how steep the platform rises? Ellipticals often offer programs that create much more resistance and difficulty, allowing you to enjoy a better work out each time. You can expect varying changes in steepness, resistance, and even intermittent backward peddling to take your cardio needs further. Most machines have a shocking number of muscles they work. When you need more than running, try the elliptical challenges.